VW will redesign former Kroyman's dealers in Berlin. Shown is the new concept. 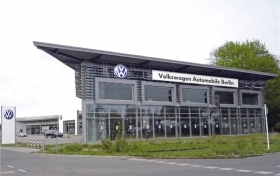 Volkswagen AG has acquired two dealerships that formerly belonged to the bankrupt dealer group Kroymans. The showrooms formerly sold cars from brands including Ford, Opel and Fiat. They will reopen by the end of the year selling VW cars under the name Volkswagen Automobile Berlin, VW said. VW sales chief Christian Klingler said the carmaker will boost its presence in two important locations in Germany's capital with the new dealers. Kroymans opened the showrooms in the densely populated districts of Spandau und Tempelhof between 2007 and 2009. The Dutch group, which had expanded rapidly into Germany from its home base in the Netherlands, declared insolvency after running into financial difficulties.